Guest author, Jorge Yepez, traveled half way around the world to "giveback." Madagascar is mysterious. Much more is unknown than is known. The island is large (double the size of Great Britain) yet was uninhabited by humans for centuries. Who were the first human visitors? When did they arrive? Did they decide to stay or did they quickly return from where they came? What exactly happened to the Giant Lemurs of Madagascar? Does or did the Kalanoro really exist? Even though the island nation is full of mystery, I found answers to many questions that I didn't even know I had. A couple of years ago, my good friend, Gary Vickrey, and his teenage son, Austin, traveled to literally the opposite end of the earth - Madagascar. They were part of a non-profit group called Youthlinc. The mission of Youthlinc is to provide a global opportunity for young people to help other young people. Their visit to Madagascar was life changing. He planned to return and invited me to join him. I was intrigued. This would be a challenging, working vacation. Part of the program included teaching vocational skills to the Malagasy people and I could share my barber skills. For a couple months I debated if I was ready for an adventure thousands of miles away. I finally decided that if educating the local women how to cut hair would make their lives better, I was up for the challenge. For 15 days during the summer of 2018, I joined a group of 36 Americans (adults and teens). We lived and worked in the small Madagascar village of Ambohibato. The visiting adults taught vocational skills and dispensed basic health information. We also supervised and toiled side by side our teens constructing family vegetable gardens and a school building. 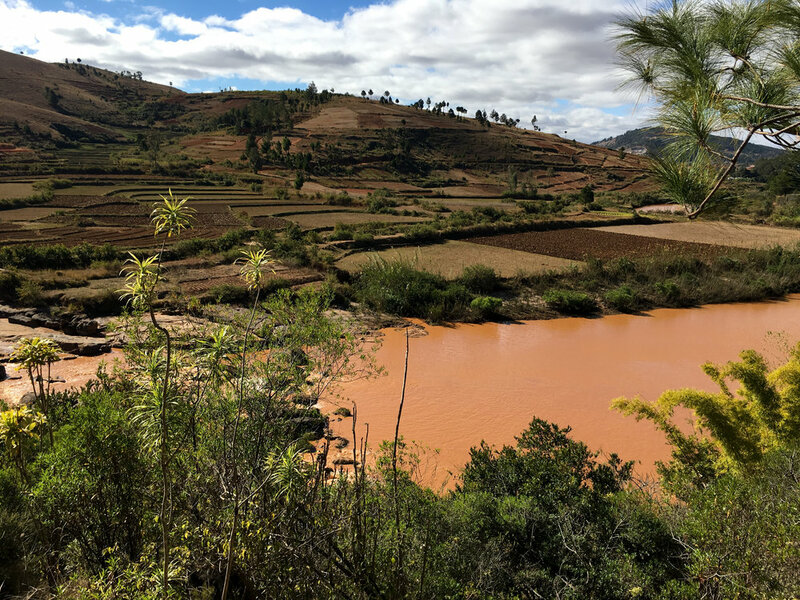 I left Madagascar with a deeper understanding of poverty even though I have spent time over the years visiting family in rural Mexico. I experienced that my small investment of time, manual labor and sharing a few basic skills improves lives. I also left a far richer man because of new Malagasy friendships. I did not know what to expect. I vaguely knew where Madagascar was because I played the board game, Risk, as a kid. Assuming the game board was geographically accurate, the island sits off the southern coast of Africa. I recall seeing Madagascar Vanilla in the grocery stores. Madagascar is also the name of a computer-animated adventure comedy film. This was the sum total of my existing Madagascar knowledge..
Madagascar is an island country in the Indian Ocean located off the coast of East Africa. It is the 4th largest island in the world. Madagascar’s population is primarily related not to Africa but rather to Indonesia which is more than 3,000 miles (4,800 km) to the east. The Malagasy people do not consider themselves to be African due to the continuing bond with France resulting from former colonial rule. As a result the island developed political, economic, and cultural links with the French-speaking countries of western Africa. The island's largest export is vanilla. Madagascar produces approximately 60% - 80% of the world’s vanilla due to the humid conditions in the north-west region. Harvesting vanilla pods is labor intensive and unfortunately, the small farmers do not reap the benefit of increased trade. Getting to Madagascar can be a challenge. The airport in Antananarivo ( the capital city) is about the size of a postage stamp but Air France makes the Paris to "Tana" round trip a few times each week. My itinerary was Salt Lake to Paris, then Paris direct to Tana. But travel doesn’t always go as planned. Our flight detoured through Africa. Finally, after 24 hours of flight time, I landed in Antananarivo. Thats when the adventure really began. Retrieving our checked luggage was tricky. All the bags ended up randomly stacked in a storage room. A few baggage handlers searched gear looking for banned items. One handler found a few dolls that were intended as gifts for the children we would meet. It eventually became clear the fellow wanted one for his child. Once we told him “yes,” the remainder of our luggage was released. With most of our belongings (others had to wait a few more days), we boarded buses and headed toward the village of La Ville Verte. My first impression of Madagascar was looking out the bus window as we drove toward La Ville Verte. Looking out the window I was overwhelmed by the pervasive poverty. I have experienced poverty visiting rural Mexico but what I saw outside the bus was on a different level. The World Bank estimates that 70% of Malagasy live on less than $1 a day. The Borgen Project explains the island has a population of over 22 million. It has an incredible amount of biodiversity, a great potential for sustainable tourism, and boasts a deep, rich heritage. However, before the mid-1990’s Madagascar was in a downward economic spiral. The non-profit clarifies the 4 main obstacles to the elimination of poverty on the island are geography, political turmoil, disintegrating infrastructure and severe water safety, sanitation and hygiene concerns. Gazing out the window I wondered what was in store for me. The bus pulled into the small village of La Ville Verte - our home for the next 2 weeks. There is no internet. However, with running water and electricity we lived in relative comfort. After stowing our belongings, our group went downstairs for orientation with our local sponsors. Our sponsors were our ambassadors, our guides, our translators and eventually our friends. We reviewed the plans for the day, gathered our supplies and walked 2 miles to the small village of Ambohibato which is where we invested our time and effort. the town has no electricity and no running water. Since our sponsors wanted us be comfortable with modern luxuries, La Ville Verte was our home base. Our group was full of anticipation on our first walk to Ambohibato. What would it be like? We discussed if we could make any kind of impact in just 2 weeks. Our previous concern of being off grid for the next 2 weeks quickly faded into the back ground as we began to get a sense of daily life in this small town. As we got closer, dancing children and lively mothers enthusiastically greeted us. I was overwhelmed by their joy and happiness. It turns out you don’t need internet or even electricity or running water to have joy in your life. Could the Malagasy people have something in their lives that we struggle to find in our modern world? Something other than material wealth? The Malagasy radiated elation and glee. Another quality I quickly noticed is everyone knows they are members of this community. Everyone is connected. Nobody is an island. Our group split up into committees - vocational, business, educational and cultural. We taught basic healthcare, small business principles, accounting, sales and how to start a small business. The cultural committee made home visits and learned about Malagasy life and shared a little about life in the US. On our free days we explored a couple National Parks with jungles full of Lemurs. These playful mammals look like a cross between a cat and a monkey. They swing from tree to tree and have no fear of people. These crazy critters even crawled on our heads! As we toured the jungle, experiencing foreign sights and sounds, I felt like explorer on an alien planet. Due to the island being isolated by humans for 88 million years, more than 600 new species have been discovered in Madagascar's unique habitats in the past decade, among them 385 plants, 42 invertebrates, 17 fish, 69 amphibians, 61 reptiles and 41 mammals, according to a report published by the conservation group WWF. The island's national parks and sanctuaries host unique plants and animals due to its isolation. The habitats are wide-ranging and shelter thousands of species of plant and animal life not found anywhere else on earth. 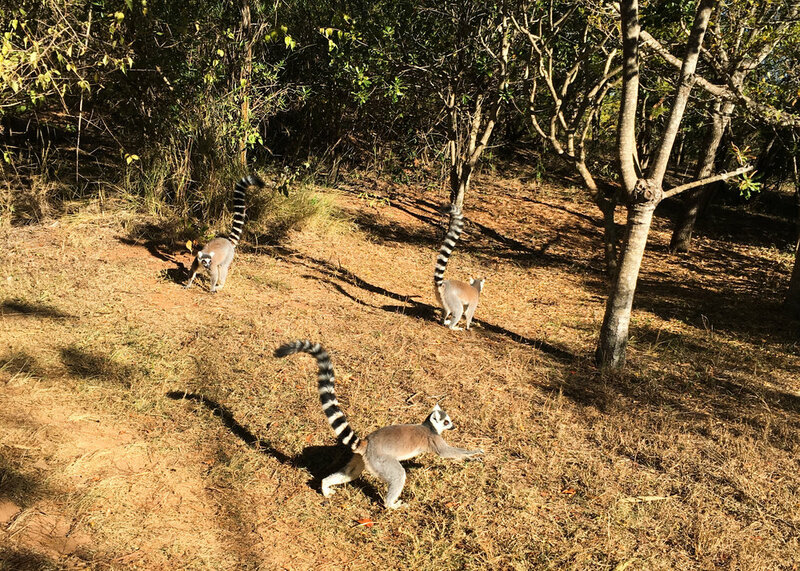 The institution Madagascar National Parks was founded in 1990 to preserve the natural resources in the national parks which include the popular Andasibe with abundant lemurs, Berenty Reserve with its dancing sifakas, Nosy Tsarabanjina and the beautiful waterfalls of Amber Mountain. The Lemurs of Madagascar are world-famous and are unique to the island. Over 100 species of lemur reside in Madagascar, including the photogenic ring-tailed lemur as well as the mouse lemur which is the smallest. Many are on the endangered list. The elusive fossa is the native predator to lemurs. A relative of the mongoose, the fossa is unique to the forests of Madagascar and are the island's largest carnivore. Unlike mongooses, and more like felines, the fossa has retractable claws and fearsome catlike teeth. Its coat is reddish brown and its muzzle resembles that of a dog. One of my fondest memories is Malagasy meal time. The ladies of Ambohibato ring the bell. Next sounds of joyful children get louder and louder as kids of all ages come running from different directions. Order quickly replaces chaos as older children assist the younger ones filling their bowls with food. They make sure the little ones find a place to sit and enjoy their meal. Only after the young ones are settled, do the older kids serve themselves. This kind ritual of allowing the youngest to eat first occurs during every communal meal. Witnessing their daily sense of community was an unforgettable experience. Survival in Ambohibato is only possible with help from your neighbors. Surviving is thriving when your neighbor is your friend. At the beginning of the trip we requested the kids turn in their cellphones even though we had no coverage most of the time. Now it was time to return them. To my surprise, our teens didn't even want them. The experience of living off grid was preferable to constant connection. Returning to normal life was a bit of a shock. I eventually connected to the internet, scrolled through hundreds of emails but only a couple were important. I missed a couple news cycles. And I kept thinking about the people I met, especially the kids. Now, when I relive a memory of the trip, a feeling of gratitude bubbles up like a spring in my heart. I am thankful to have Malagasy memories in my life. On the way back to the airport, I observed the same poverty I noticed when we arrived. But, after 2 weeks of living and working with the Malagasy, I saw traces of happy faces. Absence of money does not mean absence of joy. Paradoxically, the Malagasy were some of the happiest and most loving people I have ever met. They reminded me what really matters. Everyone on the trip felt the same. If you are adventurous and in good health, I heartily recommend giving back in Madagascar. I suggest traveling with an organized group for your first visit. You will be rewarded with unforgettable memories. The Malagasy people have big hearts, the wildlife will amaze you and I guarantee you will get back much more than you give! Most days you can find Jorge at Billy’s Barber Shop on Main Street in Park City. He does a great job with a straight edge razor shave or a haircut.